"StEPs-CT encourages all of us who participate to strive for higher standards in our organizations' operations and to increase services to our audiences." Connecticut Humanities helps local museums, historical societies, and other cultural organizations build professionalism and ensure their programs and collections remain vibrant community resources through StEPs-CT–a program created with the Connecticut League of History Organizations, and run in partnership with the Connecticut Historical Society, that guides them towards excellence in six areas of organizational practice. StEPs-CT is based on the “Standards and Excellence Program for History Organizations” (StEPs), a national model curriculum developed by the American Association for State and Local History (AASLH). We’ve added a series of hands-on workshops, expert mentors who are on call to help with the rough spots and a competitive granting fund to support projects related to the program. 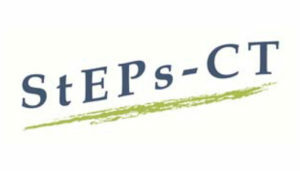 The StEPs-CT program is the first in the nation to implement the StEPs curriculum on a statewide level. To be accepted into the program, StEPs-CT organizations need to make a compelling case for how they would benefit from participation and demonstrate commitment to completing the entire program. In return, CTH provides all resources at minimal cost. StEPs-CT is an integrated program of professional development, facilitated conversation, mentorship, and competitive grant funding for smaller cultural organizations. StEPs-CT is based upon a curriculum of best practices and aligns with the national curriculum developed by the American Association for State and Local History (AASLH) called StEPs. StEPs is an acronym for “Standards and Excellence Program for History Organizations.” Since its debut in 2009, StEPs has helped nearly 900 institutions nationwide, including 51 in Connecticut, begin taking “steps” to plan for positive change. StEPs-CT is designed for smaller Connecticut museums, historical societies and other cultural organizations that are interested, willing and committed to strengthening their organizations. Check out our list of StEPs-CT Frequently Asked Questions for more information about the program, benefits of participation, and program requirements. Instructors introduce each StEPs-CT curriculum unit, discuss the section’s standards and components, lead participants through all workshop sessions, and close out each unit with a half-day feedback session. Liz Shapiro is the Executive Director of the Connecticut League of History Organizations. In this role she is the primary liaison between CLHO and its members, listening, strategizing and problem solving to help strengthen Connecticut’s heritage organizations. She is co-creator and manager of StEPs-CT. A graduate of the Cooperstown Graduate Program in History Museum Studies, Liz has over twenty-five years of experience working with small- to mid-sized museums to build capacity and ensure sustainability. She retired in 2014 from her position as director of the Sharon Historical Society after twenty-one years. Liz is currently on the advisory boards for COSTEP-CT and the Connecticut Digital Archives (CTDA) and she serves as a Peer Advisor for the state’s Peer Advisor Network (PAN). Scott Wands serves as Manager of Grants & Programs at Connecticut Humanities. He manages CTH’s non-grant-funded services to Connecticut’s cultural community and oversees CTH’s granting programs. He is co-creator and manager of StEPs-CT. A graduate of the Winterthur Program in Early American Culture from the University of Delaware, Scott currently serves as a Council Member for the American Association for State and Local History (2016-present) as well as a board member on the national Field Service Alliance. He is also a former board member of the Connecticut League of History Organizations and has served on numerous American Association for State and Local History committees, including serving as the Region 2 Chair for Awards for CT, RI, NY, and NJ from 2008-11 and 2016-17. Program mentors coach five organizations through the StEPs-CT program, providing both in-person and remote consultation time for each curriculum unit. Kathleen Craughwell-Varda is a museum curator/consultant with more than twenty-five years experience in the field. She has worked with numerous institutions in Connecticut, New York and New Jersey conducting collection surveys, exhibition research, and creating interpretive materials. She was the Assistant Director and Field Services Director of the Textile Conservation Workshop in South Salem, New York. She has been the Project Director for Conservation ConneCTion, Connecticut’s response to the IMLS “Connecting to Collections” initiative since the program was launched in 2008. She is also a founding member of COSTEP-CT (Connecticut Coordinated Statewide Emergency Preparedness) and has been an assessor for Heritage Preservation’s Collection Assessment Program (CAP) since 1994. Elizabeth Fox has assisted institutions with exhibition planning and implementation, institutional assessments and planning and collection assessment. Prior to forming her consulting company in 1997, she worked at the Yale University Art Gallery, Connecticut Landmarks, Wadsworth Atheneum and the Connecticut Historical Society. She serves on the board of the Connecticut League of History Organizations, is an advisor for the Peer Advisor Network at the Connecticut Office of Culture and Tourism and chairs the Cheshire Historic District Commission. Sarah Griswold has worked in the field of historical societies and small museums since 1991. She was the curator at the Gunn Memorial Museum in Washington, CT, and executive director at the Glebe House Museum & Gertrude Jekyll Garden in Woodbury, CT. She is currently an independent museum consultant, assisting libraries and museums in collections care, exhibit development and strategic planning, as well as research projects and programs. She works as an advisor for the Peer Advisor Network at the Connecticut Office of Culture and Tourism and serves as a Museum Assessment Program peer reviewer. Sarah is also a former member of the board of the Connecticut League of History Organizations. Jacquetta Haley completed her doctorate in American History and decided that her future lay in history museums rather than academia. She worked on the five historic properties owned by Historic Hudson Valley for twelve years before becoming an independent consultant. Her work as a consultant has covered basic research, furnishings plans for a diverse group of houses throughout the tri-state area, the development of interpretive strategies for homes with multiple story lines, and exhibitions. As a board member and president of the board of the Greater Hudson Heritage Network she has been instrumental in refocusing the organization’s strategic priorities, including serving as the Chair of the Strategic Planning Committee. Melissa Josefiak works as an independent museum professional as she raises her young daughter full time. She contributes to collections blogs, provides exhibition support and serves as the exhibitions review editor for “Connecticut History,” the scholarly journal produced by the Association for the Study of Connecticut History. She served as the assistant director of Wethersfield Historical Society for several years and served on the board of the Connecticut League of History Organizations, co-chairing its “Professional Basics” series for five years. American Clock & Watch Museum, Avery Memorial Association, Blue Slope Country Museum, Institute for American Indian Studies, Society of the Founders of Norwich, Windham Textile & History Museum, and the historical societies of Canton, Chester, Farmington, Haddam, Harwinton, Kent, Lebanon, Madison, Norwalk, Old Saybrook, Old Woodbury, Shelton, Sherman, Southbury, Torrington, Totoket, Warren and Wintonbury. Download a PDF of these FAQs here. StEPs-CT is an integrated program of professional development, facilitated conversation, mentorship, and competitive grant funding for smaller cultural organizations. StEPs-CT is a program of Connecticut Humanities (CTH) and the Connecticut League of History Organizations (CLHO) in partnership with the Connecticut Historical Society based upon a curriculum of best practices developed by the American Association for State and Local History (AASLH) called StEPs. What does StEPs stand for? What topics does StEPs-CT cover? StEPs-CT aligns with the national curriculum created by AASLH. The six standards units covered over the course of three years are: Mission, Vision, & Governance; Audience; Management; Stewardship of Collections; Stewardship of Historic Structures & Landscapes; and Interpretation. How do you define smaller? Specifically, the program is designed to support organizations with an operating budget of $150,000 or smaller. Our organization is slightly bigger than that, can we apply? If you can articulate a case for your participation, your application will be considered. Can any organization sign up for the program? Program participants are chosen through a competitive application process. The application is designed to be easy to access and complete. Participating organizations must be Connecticut-based, 501(c)3 non-profits or municipal-run organizations, and provide significant programming and/or services to the public on a regular basis and have at least one paid staff member (full- or part-time) or dedicated volunteer equivalent with a formalized job description. What are the benefits to participating in StEPs-CT? $175 for a one-time enrollment fee in the national StEPs program (includes cost of the program workbook and access to national, online StEPs community). Organizations must also maintain an institutional membership to the CLHO and AASLH for the duration of the program. $150 per unit for Returning StEPs-CT Organizations wanting to participate in one StEPs unit only. How many people from my organization can participate? Accepted organizations are allowed an unlimited number of participants. What do organizations commit to by participating in StEPs-CT? Designate a dedicated representative who will remain the primary contact throughout the course of the entire StEPs-CT program. Note: Two people from each organization must attend all sessions for each StEPs standards unit. Will all institutions commit to the entire three-year program? Not necessarily. Some organizations may elect to do the first three curriculum units only. Previous StEPs-CT organizations may elect to come back to do single units only. How many organizations will be accepted in StEPs-CT? How many mentors will be affiliated with the program? We hope to accept up to 10 organizations into the StEPs-CT program for 2018-20. We plan to include 2 program mentors per unit who will each work with up to 5 participating organizations. Who are the mentors and who will be doing the training? StEPs-CT mentors have been chosen from the Connecticut heritage community based on their experience working with small organizations on a broad variety of topics. The training sessions will be led by StEPs-CT program staff and occasionally, invited guest subject area specialists. Material that is presented during the training sessions has been created by AASLH and modified and augmented to address the needs of the StEPs-CT participants.